I would like to invite members to dump all electric Venus news and discussion in this thread. All info centralized in one thread while still possible. Last edited by nick c on Fri Mar 25, 2011 9:11 am, edited 1 time in total. Using two ESA spacecraft, planetary scientists are watching the atmospheres of Mars and Venus being stripped away into space. The simultaneous observations by Mars Express and Venus Express give scientists the data they need to investigate the evolution of the two planets’ atmospheres. The new results probe directly into the magnetic regions behind the planets, which are the predominant channels through which electrically-charged particles escape. They also present the first detection of whole atoms escaping from the atmosphere of Venus, and show that the rate of escape rose by ten times on Mars when a solar storm struck in December 2006. The new observations show that, despite the differences in size and distance from the Sun, Mars and Venus are surprisingly similar. Both planets have beams of electrically charged particles flowing out of their atmospheres. The particles are being accelerated away by interactions with the solar wind, a constant stream of electrically charged particles released by the Sun. Interestingly, this full-on interaction does create a weak magnetic field that drapes itself around each planet and stretches out behind the night-side in a long tail. Venus’s atmosphere is thick and dense, whereas that of Mars is light and tenuous. Despite the differences, the magnetometer instruments have discovered that the structure of the magnetic fields of both planets are alike. 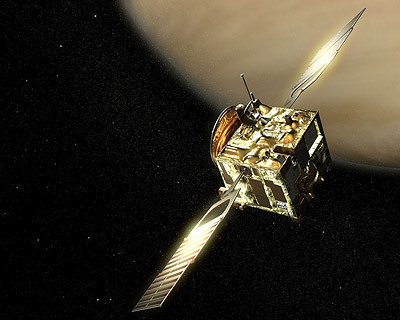 “This is because the density of the ionosphere at 250 km altitude is surprisingly similar,” says Tielong Zhang, Principal Investigator for the Venus Express magnetometer instrument at Institut für Weltraumforschung (IWF), Österreiche Akademie der Wissenschaften, Austria. The ionosphere is the surrounding shell of electrically-charged particles created by the impact of sunlight on the planet’s upper atmosphere. The proximity of Venus to the Sun does create an important difference, however. The solar wind thins out as it moves through space so the closer to the Sun it is encountered, the more concentrated is its force. This creates a stronger magnetic field, making the escaping atmospheric particles move collectively like a fluid. Another illuminating difference between Mars and Venus is that Mars displays strong small-scale magnetic fields locked into the crust of the planet. In some regions, these pockets protect the atmosphere, in others they actually help funnel the atmosphere into space. The occurrence of lightning in a planetary atmosphere enables chemical processes to take place that would not occur under standard temperatures and pressures. Although much evidence has been reported for lightning on Venus, some searches have been negative and the existence of lightning has remained controversial. A definitive detection would be the confirmation of electromagnetic, whistler-mode waves propagating from the atmosphere to the ionosphere. Here we report observations of Venus' ionosphere that reveal strong, circularly polarized, electromagnetic waves with frequencies near 100 Hz. The waves appear as bursts of radiation lasting 0.25 to 0.5 s, and have the expected properties of whistler-mode signals generated by lightning discharges in Venus' clouds. Venus has no significant internal magnetic field, which allows the solar wind to interact directly with its atmosphere. A field is induced in this interaction, which partially shields the atmosphere, but we have no knowledge of how effective that shield is at solar minimum. (Our current knowledge of the solar wind interaction with Venus is derived from measurements at solar maximum.) The bow shock is close to the planet, meaning that it is possible that some solar wind could be absorbed by the atmosphere and contribute to the evolution of the atmosphere. Here we report magnetic field measurements from the Venus Express spacecraft in the plasma environment surrounding Venus. The bow shock under low solar activity conditions seems to be in the position that would be expected from a complete deflection by a magnetized ionosphere. Therefore little solar wind enters the Venus ionosphere even at solar minimum. Venus, unlike Earth, is an extremely dry planet although both began with similar masses, distances from the Sun, and presumably water inventories. The high deuterium-to-hydrogen ratio in the venusian atmosphere relative to Earth's also indicates that the atmosphere has undergone significantly different evolution over the age of the Solar System. Present-day thermal escape is low for all atmospheric species. However, hydrogen can escape by means of collisions with hot atoms from ionospheric photochemistry, and although the bulk of O and O2 are gravitationally bound, heavy ions have been observed to escape through interaction with the solar wind. Nevertheless, their relative rates of escape, spatial distribution, and composition could not be determined from these previous measurements. Here we report Venus Express measurements showing that the dominant escaping ions are O+, He+ and H+. The escaping ions leave Venus through [b]the plasma sheet (a central portion of the plasma wake) and in a boundary layer of the induced magnetosphere[/b]. The escape rate ratios are Q(H+)/Q(O+) = 1.9; Q(He+)/Q(O+) = 0.07. The first of these implies that the escape of H+ and O+, together with the estimated escape of neutral hydrogen and oxygen, currently takes place near the stoichometric ratio corresponding to water. Venus has lightning just like Earth? Despite dense atmosphere, and disbelief of several prior probes' valid data. The new results probe directly into the magnetic regions behind the planets, which are the predominant channels through which electrically-charged particles escape. Uh...wouldn't these magnetic regions be created by the electrical flux which is also responsible for accelerating these particles in the first place? I can never make head nor tail of mainstream descriptions of electrical and magnetic activity in our Solar System, but then again my knowledge is pretty basic. Great to see the forum return! Perhaps they mean that the vacuum of space itself is magnetic...?? Well, in any event... Good times. Agreed, it's good to see the forums come back up and go back to business as usual, or something close to it. How about a relation top the electric discharges tormenting the Venusian atmosphere? ESA’s Venus Express has measured a highly variable quantity of the volcanic gas sulphur dioxide in the atmosphere of Venus. Scientists must now decide whether this is evidence for active volcanoes on Venus, or linked to a hitherto unknown mechanism affecting the upper atmosphere. On Earth, sulphur compounds do not stay in the atmosphere for long. Instead, they react with the surface of the planet. The same is thought to be true at Venus, although the reactions are much slower, with a time scale of 20 million years. The SPICAV (Spectroscopy for Investigation of Characteristics of the Atmosphere of Venus) instrument analyses the way starlight or sunlight is absorbed by Venus’s atmosphere. The absorbed light tells scientists the identity of the atoms and molecules found in the planet’s atmosphere. This technique works only in the more tenuous upper atmosphere, above the clouds at an altitude of 70–90 km. In the space of a few days, the quantity of sulphur dioxide in the upper atmosphere dropped by two-thirds. Jean-Loup Bertaux, Service d’Aeronomie du CNRS, Verrières-le-Buisson, is the Principal Investigator for SPICAV. “I am very sceptical about the volcanic hypothesis,” he says. “However, I must admit that we don’t understand yet why there is so much SO2 at high altitudes, where it should be destroyed rapidly by solar light, and why it is varying so wildly. The variation appears to be smaller in the lower atmosphere. ”With VIRTIS, we monitor sulphur dioxide at an altitude of 35–40 km, and we have seen no change larger than 40% on a global scale over the last two years,” says Giuseppe Piccioni, VIRTIS co-Principal Investigator, IASF-INAF in Rome. The only way to be absolutely certain that active volcanism is taking place on Venus is to see a volcano in action. This is not easy when you are trying to look through 100 km of thick, cloudy atmosphere. The first is to look for localised increases in sulphur dioxide that would indicate a large plume of the gas issuing from a volcano. The other way is to look for hot spots on the surface that can be shown to be fresh lava flows. In both cases, the instrument to use is VIRTIS. “No thermal anomaly has been detected so far,” says Pierre Drossart, Observatoire de Paris, France, and co-Principal Investigator on VIRTIS. Thanks to the unique ability of its VIRTIS spectrometer to use these spectral windows, Venus Express has mapped the atmosphere over many orbits and has covered the lower atmosphere for the first time. The atmosphere of Venus is dominated by carbon dioxide but as VIRTIS looked on, it detected the signature of carbon monoxide, an unusual find in the planet’s deep atmosphere. 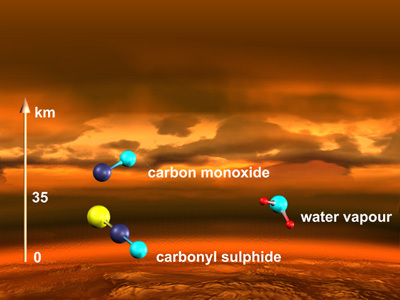 Looking further, in higher resolution, scientists also found carbonyl sulphide and water vapour. Since the early 1980s these molecules were known to exist on Venus, but before Venus Express they had never been measured and mapped so extensively and accurately. Carbon monoxide is such a rarity on Venus that it can be used as a tracer to monitor circulation patterns in the atmosphere. It is like studying the flow of fluorescent ink dropped into a liquid to reveal the circulation pattern in the liquid itself. The presence of carbonyl sulphide is usually linked to carbon monoxide: wherever there is abundant carbonyl sulphide, there will be little carbon monoxide and vice versa. Past observations have already suggested that this is the case, and VIRTIS has mapped the distribution with greater accuracy. If one subscribes to the theory that Venus is a young planet whose high temperatures are the result of internal (natal) heat radiating from the planet, as it is in the process of cooling down, than there would be no surprise with the discovery of volcanism. Certainly, volcanism would be consistent with the cooling of a planet that is not in thermal equilibrium. Comment: Most of the 'volcanoes' on Venus are electrical scars. That may be why no obvious lava flows occurred during the Magellan Orbiter radar surveillance of the planet. A steady fall in sulfur dioxide levels detected by the Pioneer Orbiter over a time span of several years may have been due to a giant volcano erupting shortly before. But it also possible that another simple nuclear reaction is taking place at the surface of Venus, involving the combination of the two atoms of oxygen in an oxygen molecule to form one atom of sulfur. It is a process occurring today in plain view on Jupiter's moon, Io. In any case, volcanoes are an electric discharge phenomenon so that the discovery of active volcanoes on Venus cannot be used as a distinguishing test for or against the electrical model of Venus. Most of the features on Venus that are presently attributed to volcanism have better electrical explanations, but don't be surprised if active volcanoes are discovered on Venus. Of course I'm not discounting any volcanic-structures, but maybe there is a different electro-chemic solution. Venus is often considered to be Earth’s sister planet because of their similarities in size and density, and their neighborly positions in the Solar System. Assuming two planets so close to each other would have condensed in a similar fashion during the birth and growth of the Solar System, many scientists believed that the two would have similar histories and features. Up until the 1970’s and 1980’s, however, we humble earthlings were unable to see the surface of Venus due to the thick carbon dioxide clouds that shroud the entire planet. Radar and photographic information obtained during the Venera, Pioneer Venus, Vega, and Magellan missions provide new insights into the surface features and forces acting on our close planetary neighbor. Three major geologic provinces exist on Venus. They are the smooth lowland plains which comprise about 20 percent of the total surface area, the rolling volcanic uplands, ~70 percent, and the mountainous highlands, ~10 percent. This module will show features from each of these provinces, and outline the geologic forces acting on each in order to help you better understand their formation. These large plains consist of extensive, probably basaltic, lava flows and could be compared to the Earth’s ocean basins in respect to extent and composition. Features seen within the lowlands include broad bowl-like depressions, flood lavas (similar to the Columbia River Basalts on Earth), lava channels that can extend for hundreds of kilometers, and compressional ridges. The largest lowland feature is Atalanta Planitia, which is located east of Ishtar Terra (~165° E Long., 65° N Lat.) and is about the size of the Gulf of Mexico. -Lowlands are typically manifested as circular depressions. -Hotspot volcanism that would produce large shield volcanoes is not observed. -Extensional rifts like those on hot spot swells have not been identified. -Lowland plains are dominated by compressional features. The lowland plains also contain ridges and valleys that comprise sinuous ridge belts braided together for thousands of kilometers around topographic basins such as Atalanta Planitia and Lavinia Planitia. A general lack of many large volcanic and impact related features in the lowlands indicates that this area may have been formed by strong compressional tectonic forces as the venusian mantle was convecting and thus wrinkling the surface. Uplands represent a transition of terrain from the lowland plains to the highlands. Doming of the lithosphere implies large upwelling thermal plumes from the mantle that are possibly responsible for creating these uplands. Doming resulted in extension of the crust above, and led to predominantly extensional tectonic features, such as fracture belts, troughs, grabens, and rifts. The best example of an upland dome is Beta Regio, (Figure 12 in Chapter 7 of the text) located around 280° E. long. and 30° N. lat. This region is 2500 kilometers across and contains a huge shield volcano, numerous crisscrossing faults, and several circular coronae. The highlands of Venus have been compared to the continents on the Earth. They are the highest elevations on Venus, with mountain peaks up to 11 kilometers above the mean, large wrinkled mountain chains, and relatively flat, plateau-like expanses. The highest area on Venus is located in Ishtar Terra which lies in the Northern Hemisphere and is about the size of Australia. The largest highland region on Venus is Aphrodite Terra which is located near the equator and is more than half the size of Africa. Like the lowlands, the features in the highlands seem to be primarily compressional in origin, suggesting that the area was formed by crustal thickening over a downwelling mantle. Compressional folds, ridges, and troughs within Maxwell Montes, the highest point on Venus and one of the large mountain belts within Ishtar Terra, indicate lateral crustal movement. Although Venus is similar to Earth in size, mass, and density, its surface environment is hostile, with mean surface temperatures of 475 degrees Centigrade, a lack of water, and a thick atmosphere dominated by CO2 gas. More than 98% of the Venusian surface has been mapped at a resolution of about 100 meters by NASA's Magellan mission in 1990 through 1994. Regional variations in surface height are shown in the image left, where highlands are depicted in white to tannish colors, uplands in greenish colors, and lowlands in bluish colors. The entire surface of Venus is younger than expected due to a massive resurfacing event associated with flood basalt volcanism. These vast lava plains are best preserved in the lowland regions. The relative ages of impact craters on the lava plains suggest that this voluminous outpouring of basalt could be as young as 300 million years ago, or as old as 1600 million years ago. All of the well-developed volcanic features discussed below appear to be younger than the global resurfacing event. numerical [2,7] and analog [8,9] models of coronae formation. patterns or ridges extending outward for several radii” . Arachnoids are smaller than most coronae, but have a similar genesis. They features differ from coronae in that they contain a network of both radial and concentric structures that gives the appearance of a spider sitting on interconnected webs of bright lines, hence the name arachnoid, which is Greek for spider. The radial structures appear to be dike intrusions that stand out as ridges. Although it is thought that both coronae and arachnoids form in association with rising plumes of mantle, the magmatism associated with arachnoids may be largely intrusive, whereas magmatism associated with coronae is largely extrusive. There have been 265 arachnoids thus far identified on Venus. [5,6,14,16]. Some of calderas are corona-like [15-16]. formation of large strato- or shield volcano [15-16].